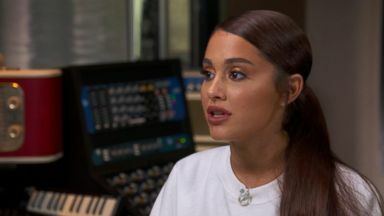 The pop music superstar spoke to ABC News' Michael Strahan about her new album, her upcoming wedding plans with Davidson and finding healing after Manchester. Reporter: It was the mom that brought down the house. orter:grande performing her hit song "God is a woman"the mtv O music awards. An emotional high poi after roller coaster yea for the star with new fe -- Pete Davidson, thanks existing, love you. Orter: And a new Albu ??? light Ising to give back everng the darkness stole ??? Reportehe is kno for her big vocals, hitting high no hits like "Problem." ?????? and "Into you." ?????? no strange ess, but this time she'saking a comeba I want you to finish since fo . Thistee is, aria ande is? I don't know, man. Living her bfe. Grul. Happy. Reporter: A year ago, Thi kind of happiness didn't seem possible after hife changed an instant. Last may, deadly blast rang out fwing the S Manchester performance. Auicideomber killed 22 and injured reds more. Lot of people thought N't going to perform ag eah, I didn't think I was G to either. Eporter: Less than two weeks following the tragedy she was center stin Manchester again. I love you with all my heart. Reporter: For "One love manche," a bitoncert she orzed for the victims of thebombin I didn't think anyone going show U at my shows and they did. Over 50,000 people. Reporter: At of triumph af dizzying year that out her backthstudio. The powerful "N tears L to Y" an anthem to her experien. ??? I just want toe up??? Reporter: Now herost intimate album yet. "Sweetener." This album is more personal to you? Happens, things happen. Yeah, I felt very inspihis ti Congratulations on it, by the way. I cany look a you because I'm log down at yourger. Congratulations on your engagement. Thank you, you so much. To the very ted, V nny petedavidson. Reportehe couple announcingir surprise engagementer this suer af just weeks of dating.how do you meet him on "Snl," then I'm going to how do you do th I overheard -- do you want smoke someot O something? Huh, let's smoke some crac man. I'm good. I wasoking. I decided he was so cute. They thing we said each other is like, . De just workedtogeth I was like,oing to marry that man. Cut to three years ter. He ticks eve box. Justets Bette every day. Rteoth touched by traged Pete lost his father, an fdny firefir in 9/11.haeen on about his ggles wit mental health, song Ariana has beenal Abt herself, breaking down in this bea 1 interview. Mental health is so important. People don't pay enough mind to it. Because we have things to do. How did you KNOE was the one you? , Just like a feeling, you know? Thato ch. People are always like, when ,ou know. You're like, , yeah, whatever,okay. Orter: The couple is want you in my life. Reporter: Arianncn od to her fiance one album titled "Pete vidson." I justanto send to him a nice little letter. A will strike down upon thee -- Rter: Som help from prettytedfriends. Youe "God is the woman. Madonn the voicef god. Whade you choose madonn She's paved the W for every LE at working today. That Madonna probably did fi Reporter: Her latest, the culmination of anncredibly emotional year. Ths one song on at the end of the album "Get wellsoon there's 40f silence at end of the Ng. Yeah. I wanted to honor the Manchester victims. I wanted to make T length the song 22, just as a LE way to like celebrate and like honor them and the lives a stuff.I wanted to add that to the end the album to give them a little G and kiss. Reporter: For "Nitline," I'm Michael Strahan in New York. "You just feel it," she told ABC News' Michael Strahan on finding her soulmate, adding that her fiancee "gets better every day." 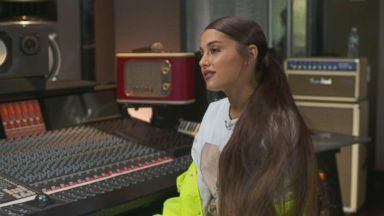 The pop superstar sat down with "GMA" more than one year after the attack at Manchester Arena and explains that the love from her fans pushed her quick return to the stage.